67th Annual Delegates’ Conference (2018). Dates: Friday 16th November 2018 at 1300 hrs to Sunday 18th November 2018 at 1600 hrs. 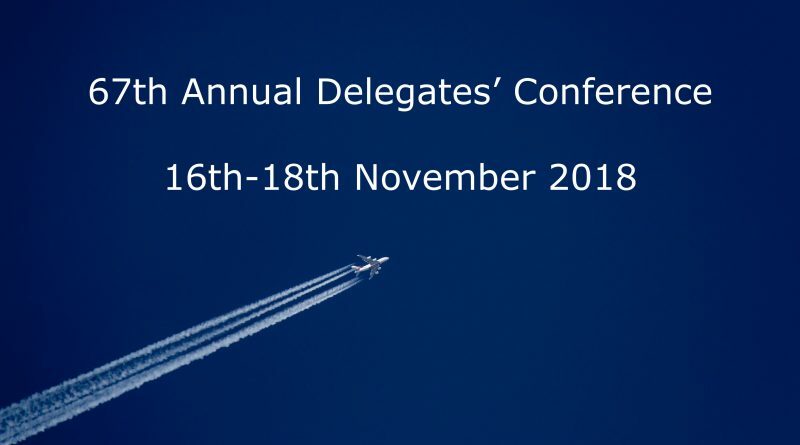 Delegates are respectfully requested to ensure that their transport arrangements allow them to remain at Bredbury until the close of Conference (1600 Sunday). Nominations for Officers of the Branch and other BEC positions. Nominations MUST be made online via the ATCOs’ Branch Website. Nominations for Auditors and the Standing Orders Committee. Motions should be submitted online via the ATCOs’ Branch Website. Friday 21st September 2018 at 1200 hrs. Members are reminded that the most recent edition of Branch Policy (Version 1.0, 2018) can be downloaded from the ATCOs’ Branch Website. All previous editions are no longer valid. Names and contact details of Delegates to Conference. Delegates MUST be registered online using the form on the ATCOs’ Branch Website. Names of volunteers to act as Tellers, submitted by units. Please register using the Delegate Registration form available on the ATCOs’ Branch Website. Special dietary requests etc. can be made online and will be automatically forwarded to the Conference Organiser. Members of the BEC are requested to confirm their attendance (or otherwise) and accommodation requirements online using the BEC Registration Form on the ATCOs’ Branch Website. Details of Guests and their accommodation requirements should also be registered by those issuing the invitation using the BEC Registration online form. Branch Members are welcome to observe proceedings. Delegates and Volunteers must be registered on-line with the SOC by Friday 21st September 2018, 1200 hrs. The SOC will only accept motions submitted by e-mail in exceptional circumstances. This method should not be used unless absolutely unavoidable. Reports can also be filed directly through the ATCOs’ Branch Website. SUNDAY 11th NOVEMBER 2018 at 1200 hrs.